Roberts TechWorld: My user experience with IBM Docs collaboration - blew me away! Docs Rocks! My user experience with IBM Docs collaboration - blew me away! Docs Rocks! I thought I knew what IBM Docs was..... I most certainly did not! I mean, don´t get me wrong, I knew what Docs can do and what options you have with integration with Connections Files, but what I experienced yesterday, it was just euphoric !! A little background about IBM Docs, so that we are all on the same page here; With IBM Docs you can create and share documents over the Web. You can collaborate with your colleagues, update and edit "live" shared documents, presentations or spreadsheets. IBM Docs is 100% integrated into IBM Connections where all editable files are just a click away from being opened in IBM Docs. You can access an editor similar to Word, Powerpoint or Excel, where you among other things can format numbers, text, and add images and shapes. You can choose whether the documents should be private or shared. If you share it, you can choose if everyone should have access to them, or just a selected few. If you set the document to be private, it´s only accessible and viewable to you. You can also choose whether or not the persons you are sharing the document with, has access to edit it, add comments or simply only have read-only access to it. The document is automatically saved when you write/edit it, so that you don´t have to worry about this yourself. When you're finished, publish it into your Connections Files archive, publicly or privately. The features of IBM Docs probably covers 95% of the need users have. Imagine that 95% of the company uses this and the remaining 5% have a need that indicates that full version of office package is installed. Thats money-saving for ya! What I knew about Docs, and what I've tested previously, is to view files located in IBM Connections, and maybe edit some of them, all in a browser window. Simple, faster, you do not have to download the file first, edit it locally and then uploading a new version, as it is in a default IBM Connections out-of-the-box installation. 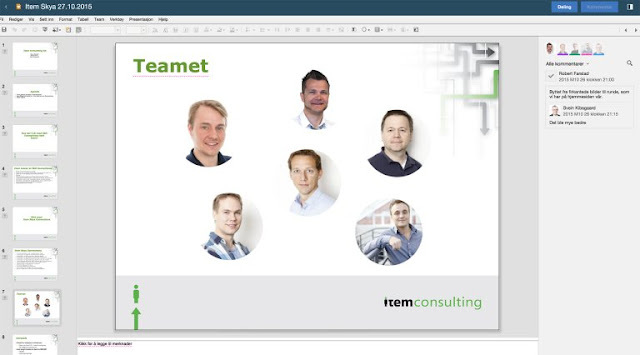 Yesterday evening, I sat at home with my colleagues Svein, Runar, and Mathis, who where sitting in their respected houses as well, and edited a presentation to one of our customers, AT THE SAME TIME! And the thing that was euphoric, was the short amount of time it took to make a presentation in which 4 people contributed. How did such a mock-up of a presentation come together earlier? Well, one person did a little part, sent the file to some other guy, who then did some changes, back and forth, back and forth and then the whole presentation was probably glued together at the end. Perhaps also with face-2-face meeting to finalize the presentation. Yesterday, I sat and inserted the images. Meanwhile I saw that different colors bounced around on the other slides, up and down, blue, yellow and green. Docs shows each person that´s editing the document with different color codes. So when I was on slide 9, I saw for instance that Mathis clicked on slide 10. When I clicked on slide 10 simultaneously, I could see that the element he edited there and then, was locked for me, but I could see what changes he did "on-the-fly", letter by letter. When he was finished, I could click on the item and "take over" the editing of it. At the same time I saw some blue and green colors on the other slides, bounce up and down, indicating activity of the others who edited simultaneously. When I made changes, I could comment on the change, and actually bring up a discussion on the change; "Is this a better approach?" with answers and responses from the other participants. And when everyone was happy, the only thing remaining was to publish the result. Cheers from a happy Robert. No, not at all, rather more liberated. I guess, if this presentation we made was to have amazing slide transition effects, I would assume that a full, blown office desktop editor is needed. But collaboration-wise, this was the complete opposite of beeing handicapped.